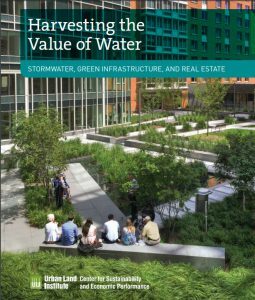 “Harvesting the Value of Water: Stormwater, Green Infrastructure, and Real Estate”, released on May 2 by the Urban Land Institute (Washington, D.C.), outlines the benefits of green infrastructure through the lens of the urban real estate industry. Development is one of many U.S. sectors in which green infrastructure implementation is gaining popularity. Urban Land Institute. Implementing green infrastructure solutions over traditional gray infrastructure in urban areas not only carries benefits for the environment, but also for real estate developers’ bottom-lines, according to a May 2 report from the Urban Land Institute (ULI; Washington, D.C.). The report, Harvesting the Value of Water: Stormwater, Green Infrastructure, and Real Estate, contends that incorporating sustainable designs such as rain gardens, bioswales, and green roofs can create value for real estate projects. These sustainable design elements help by lowering operational costs associated with stormwater management and by increasing curb appeal for potential tenants. “The development community is addressing the challenge of stormwater management with creative solutions that are not only conserving water, but also adding value and appeal to real estate projects across the nation,” said Katharine Burgess, ULI’s Urban Resilience Program director. The report outlines case studies from real estate developments in 10 U.S. cities of varying climates. Each of these developments — from a utility headquarters in Burbank, Calif., to a ‘green skyscraper’ in Boston, Mass. — demonstrates the versatile ability of green infrastructure to save developable space, promote environmentally responsible water stewardship practices, and slash stormwater management costs. significant lifetime cost savings over traditional gray infrastructure. “Whether by increasing potential development yield, introducing tangible amenities for residents, reducing operating costs, or building on a broader placemaking strategy, innovative stormwater management strategies can create value and contribute to the quality of life and resilience in cities,” the report says. As the concept of green infrastructure increasingly gains traction in different industries, the report also surmises that the range of possible green infrastructure designs is growing. Whereas most green infrastructure solutions are better suited to some regions than others, report authors speculate that a wider suite of designs — cost-effective within all climates, rainfall frequencies, amounts of land space, and local regulations — will emerge as green infrastructure adoption rates rise. The Urban Land Institute report names versatility as a major advantage of green infrastructure over traditional grey infrastructure. 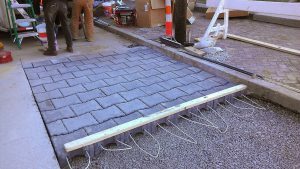 Installments such as permeable pavement provide effective stormwater management while remaining inconspicuous, visually pleasing, and inexpensive. U.S. Environmental Protection Agency.